The MC14 is a BGA memory Ramsink made of forged copper and optimized for convection cooling. 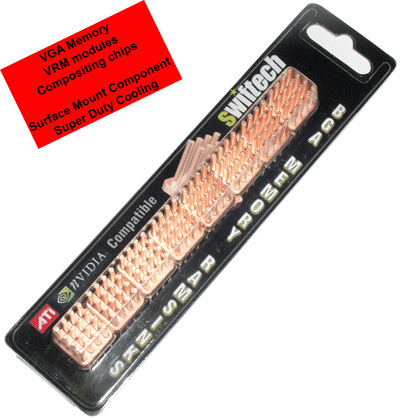 It was designed for cooling of memory components such as those found in graphic cards, but it works equally well with motherboard VRM modules , compositing chips, or any SMC in need of superior cooling. It is a perfect companion to our VGA liquid cooling solutions thus allowing high-end graphic cards to operate in virtual silence. * The MC14 is made of forged copper. The density of the pins has been calculated to offer maximum surface area to increase heat dissipation, while allowing the heated air to circulate freely between the pins. * High quality thermal pads: the high quality Berquist thermal tape offers excellent thermal conductivity. * Quick, safe and easy installation: simply peel-off the protective paper, and press the Ramsink onto the component to be cooled. * Sold in convenenient pack of 8 pieces.